One lasting legacy that our friend Alan Southworth left was the audio tapes that he had diligently recorded at each Blackpool convention, right from when he joined the Society in 1978 until as late as 2010. Alan would simply place a cassette recorder somewhere on stage and capture the performances throughout the weekend. 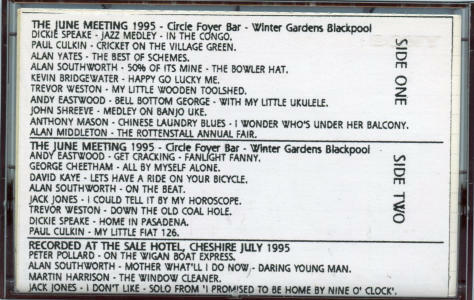 He would then edit what he had and create a 90-minute cassette which he would make available to members at the next convention. These days the medium of cassette tapes and the players to play them are consigned to the audio history books (even compact discs and DVD’s are going the same way), fortunately when Alan’s wife Hilda kindly gave me all the tapes, she also included Alan’s equipment which will allow me (over a long period of time) to convert all these archive gems to computer files which will allow us to enjoy once again, the efforts of members at GFS meetings from all those years ago. Have a listen to some of the tracks on this page to be transported back in time. Obviously some of the members on the tapes are no longer with us so I cannot think of a nicer way to remember them then to reproduce their songs. I also think it is a nice way to remember obscure songs that the members would sometimes perform. In short, it is a treasure trove of all that is good about the GFS and the fact that Alan stuck to the task for all those years says so much about this very devoted member. 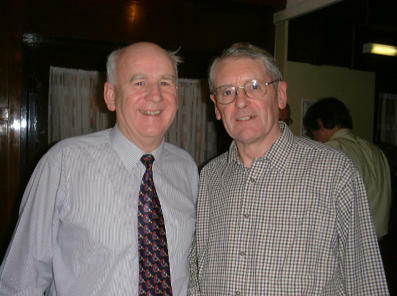 Alan with Dennis Mitchell at the November 2001 convention. 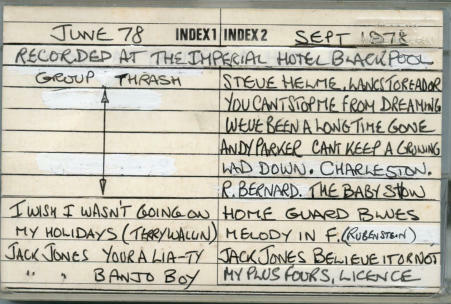 A selection from the many recordings - more later!